I am glad to receive your letter and to learn that everything is going on well at home. I want to tell you that my studies are going on in full swing these days. You will be pleased to learn that I have secured a very high percentage of marks in the Half Yearly Examination held in the month of December last. I am now quite certain of securing first division in the ensuing Final Examination. Dear father, I wish to say that I have to purchase a good dictionary and a few latest books on subjects like Physics and chemistry. 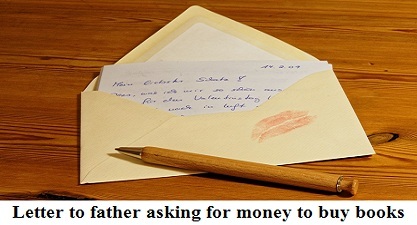 Therefore, I request you to kindly send me rupees one hundred by money order at your earliest. With regards to rather and love to Ritu and Kamal.